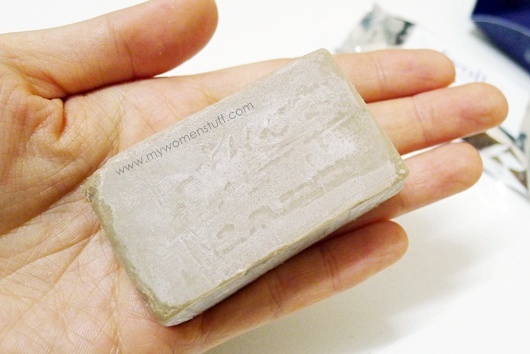 Home » Skincare » Cleanser » Evolle Facial Bar : Miracle Soap? 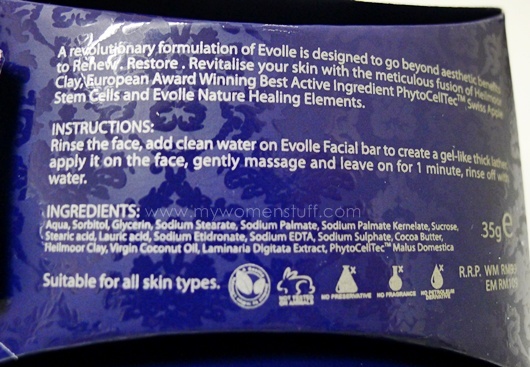 Evolle Facial Bar : Miracle Soap? But there’s a soap that does and its called the Evolle Facial Bar. You can’t just get it off the shelves unfortunately. You can find it online or at authorised distributors. Mine was sent to me for trial and I must say I was intrigued. The Evolle soap is made from Heilmoor clay (Austria Deep Moor – Tiefenmoor) from Austria Europe, PhytoCellTec Swiss Apple Stem Cells, Laminaria Digitata Extract from the North Atlantic, Virgin Coconut Oil, Cocoa Butter, and Evolle Natural Soap Base, most of which mean nothing to me. I did try looking up Heilmoor clay but what I found was that it is essentially a type of moor clay found in Austria. It is also used in numerous other spa products and clay masks and other “miracle soap” type products. Nevermind all the marketing jargon though. How was it for me? Touched by a miracle and all that? I did like using the Evolle soap. I will confess that. You have to wet your hands, then lather up the soap and apply it to your skin. Leave it on for a minute and then wash it off. The leave on bit is a bother, but I do find that from first use, my skin is noticeably smoother to the touch. It cleans very well but does not feel dry and to test this, I strolled around without moisturizer for a while after washing my face. No dryness or taut feeling but it does set in after a spell so treat this as you would any facial cleanser and always follow up with moisturiser. If you look around online, some people tell you that by just using this soap you can ditch all your other skincare. I say no. This is a soap and a cleanser. Nothing more than that to me. I still need my serums and moisturisers if I don’t want to dry out into a husk. With regular use day and night over about 3 weeks, I found my skin becoming smoother with less rough bumpy bits. Its almost like as if I used an exfoliator or AHA face wash everyday, and that was the nice bit because it wasn’t drying. I also had some stubborn spots under my skin around my chin area. I’d been trying hard to get rid of them, but they were always there. In the month since using this Evolle soap, I realized the spots and bumps were gone. The skin on my chin is so much smoother! So nice! The spots aside, smoother, softer skin was what I experienced mostly. The website doesn’t tell me what else I should expect either, although Connie did experience some help with line reduction. For myself, whatever lines I have are still there and I do use anti-aging wrinkle reducing serums often so perhaps I’m not your best test subject for that. How about pigmentation and freckles? Still there I’m afraid. The soap bar is rather malleable. It feels like firm Play-Doh or plasticine so if you squeeze too hard, it’ll go misshapen. I found it shrinks quite quickly with regular use so a bar can last you maybe 1 month with twice a day usage. Hence my complaint again about how expensive this is for regular use. I do notice that the key ingredients they have listed as the active ingredients are placed far below with Aqua and various Sodiums taking up the first 2 lines. I’m not a champ at reading ingredient lists, but I did a quick online search and the first lot of ingredients before Cocoa Butter is mostly soap making ingredients. This sort of puts a bit of damper on things if you are expecting a miracle. But if you just treat this as a regular facial soap, you’ll be ok.
Cons: Only available through distributors or online, I did not experience reduction of lines or brighter skin, Expensive! I have come across numerous similar products online but this is the first time I’m trying a “miracle soap”. Can’t say my life has been changed in any way, but I sure do like how soft and smooth my skin is and how easily it absorbs my lotions or creams thereafter. The high pricetag is very off putting to me though. I’m no stranger to splurging on skincare but unfortunately not for a cleanser. Pity about the price really. I liked it otherwise. 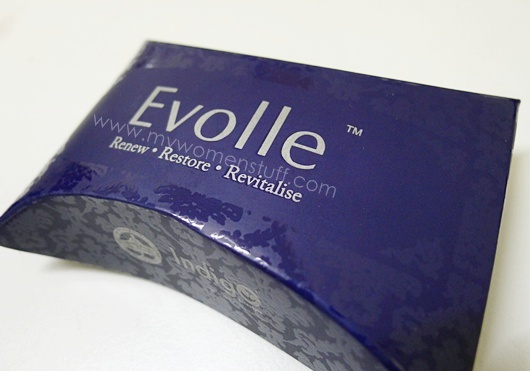 The Evolle Facial Soap bar retails for RM99/35g and is available from www.evolle.com (priced in USD) or its authorized distributors. Disclosure: Featured product was sent by PR for consideration. For posting guidelines please read the disclaimer. PREVIOUS POST: Discount voucher for MWS Readers at Min International Hair Studio by Shunji Matsuo! hmm i would love to try this, but like you, i never splurge on facial cleanser. zzz. btw, my skin is finally recovering well, in fact i’m surprised that the scars are fading so fast when i think of how horrifying my skin was before this. my forehead is totally clear now, with absolutely NO signs that it was ever pimply. phew! and u wud never GUESS what moisturizer im using now. i’m using *gasp* WATSON’s own brand Rose Fairy moisturizer. harhar! i’ve yet to find a serum that works tho, my trusty Lancome Primeordiale and Diorsnow White reveal essence isnt working anymore since my hormone change. sigh. any suggestions, as my skin seems to be quite like yours? i’m feeling weirded out using just moisturizer and nothing else. hrms. i’ve also been swayed between wanting to try either of these 2. but how bout day serum? think i’m gonna go get samples first, hmpfh. Definitely get the samples first. In the day, I was using the Estee Lauder Hydrationist. Have been for a while. Else I just go without serum and just use moisturizer. Sadly its true. But when it works a little, it shouldn’t attack me THAT much >.< Would have been nice if they say, cut the price in half. I might still consider. Hey, thanks for pointing out the price! I didn’t notice the USD at all! >.< If it was as amazing and miraculous as it claims to be, then the price would be a small one to pay but if it's just alright, I don't think I can justify! They don’t say its USD on the website, that’s the problem! I went all the way to checkout and then I was told it was USD. Lucky I opted for Paypal so I cancelled. It was too sneaky. I didn’t appreciate that. Mighty expensive!! 39USD for a single bar of soap?!? My skin is surely in need of a miracle, but the price is prohibitive!